My office is a total pigsty. I haven’t tidied it for weeks and the big pile of paper at the end of my desk that has all my notes, bills and important paperwork in has just collapsed like a demolished building all over my desk and the floor. Dylan my little Jack Russell puppy thinks this great and is doing a very good impression of a shredder. Which would be OK if he wasn’t shredding things I really need. 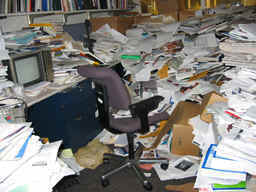 You see, Disorganisation and mess really is the anathema to an Idler. It causes more work than necessary, creates stress and panic and a total waste of energy. Being Slow or being an Idler (some people argue that they are 2 different things, but that is a subject for another post) requires a certain amount of self-discipline. It is, after all, about taking responsibility for your life, rather than letting someone else telling you what you should do. 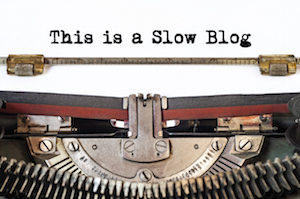 The Slow Life is not about being lazy or slothful or ignoring things that need to be done, it is about doing things in the most appropriate way (for you) using the exact amount of energy and the right pace. In fact I would argue that being “fast” is really being lazy and slothful as you are being dragged along with the frantic pace of things rather than making a stand. A diary – I like paper ones, but if you want to use an electrical one that’s fine. Moleskine do a very nice range. Or you can get the Idlers Diary from their website. Just something to jot important notes, reminders and appointments. A place to file stuff – sorted into relevant sections: Bank, Bills, etc. Whatever suites you best. Anyway, I better go and tidy up.